NEW YORK (AP) -- McDonald's is adding three new Quarter Pounders to its menu as the fast-food chain looks to offer cheaper premium burgers while capitalizing on one of its most popular brands. The company, based in Oak Brook, Ill., says the new burgers will replace its meatier Angus Third Pounders, which were among the most expensive items on its menu at around $4 to $5. 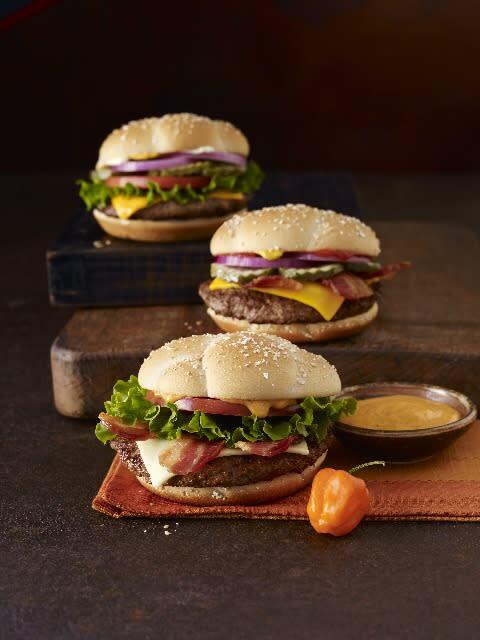 The Quarter Pounders will come in two of the same varieties as the Angus burgers — Bacon and Cheese and Deluxe. The third option will be Habanero Ranch. McDonald's Corp., which has about 14,000 U.S. locations, says the new burgers will roll out nationally in mid-June. The new Quarter Pounder line will use a bun that has eight grams of whole grains, while the original Quarter Pounder will stay with its regular bun. McDonald's has also been going to greater lengths to emphasize the affordability of its food in a push to turn around slumping sales. That has forced Burger King and Wendy's to adjust their marketing and focus more heavily on deals as well. Analysts worry that the escalating value wars will lead to shrinking profit margins. But McDonald's executives say the strategy is necessary to steal away customers at a time when the restaurant industry is barely growing. Greg Watson, senior vice president of the menu innovation team at McDonald's USA, said the company started looking at revamping its burger portfolio about a year ago and realized that it hadn't done much to tinker with the Quarter Pounder, which was introduced in 1971 and remains one of the chain's best sellers. "Once we created these burgers, we didn't see the need for the Angus line," Watson said. Watson said that "price was not really a driver" in swapping out the Angus burgers for the Quarter Pounders. But he conceded that "the Quarter Pounder will be an even greater value than the Angus burgers." Beyond fighting for price-conscious customers, traditional fast-food chains are also struggling with the more fundamental problem of changing eating habits. The worry is that people in their 20s and 30s in particular are increasingly heading to chains such as Chipotle Mexican Grill Inc., which offer food that's seen as being higher quality. The desire to eat better is also reflected in the growth of Subway, which now has about 26,000 U.S. locations and positions itself as a healthier alternative to traditional fast food. To win back younger customers, McDonald's recently rolled out its chicken McWraps. A version of its Egg McMuffin made with egg whites and a whole grain muffin was also introduced. In addition to the new buns, the new Quarter Pounders will also use a thicker apple wood-smoked bacon. McDonald's says the bacon will replace the hickory-smoked bacon currently used in its other sandwiches as well. McDonald's is hoping such new items and ingredients can give slumping sales a boost. Late last year, the company said a monthly sales figure fell for the first time in nearly decade. Sales at restaurants open at least 13 months were also down for the first three months of this year.